1881 Org Chart - Contribute Become a Governor Coming Soon a new 1881 software called "Connect"
Football at University of Ottawa began in 1881. The first ever organized college football game in North America was played in 1874 between McGill and Harvard. The two-game football series, played at Cambridge, Mass., May 14 and 15, 1874, were the first games of North American-style football. The Gee-Gees became Yates Cup champions for the first time in 1907. Father William Stanton coached the team to an intercollegiate championship in 1907, a league that featured teams from Queens, McGill & Toronto. Hall of Famer Silver Quilty played in that era, as did (HOF) Joseph Cornellier. The team competed in the league until 1912, when for various reasons, the Gee-Gees left the league & joined the Canadian Senior Rugby League, and played against such teams as the Hamilton Tigers, Toronto Argos & Montreal.Varsity Oval, as pictured in 1953. The original home to the Garnet and Grey. Father Stanton was the head coach of the Gee-Gees for three seasons, posting an 8-5-2 record. His innovations to the game of Canadian football were great. His additions to the game include the spiral punt, the football sweater, and deception plays. 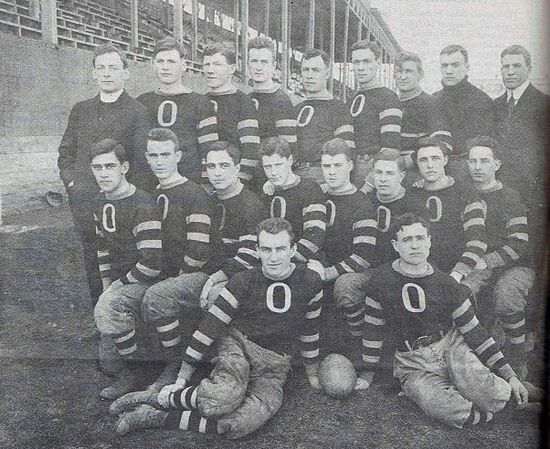 1912 Garnet and Grey varsity football team. Coached by Father William Stanton (top left). With World War 1 and it's aftermath, it was not until 1927 that the university fielded a team, and this only at the local level. However by 1931, they had returned to the intercollegiate level & were competing against RMC & non-varsity teams from Queens & Toronto. Future Hall of Fame member Jim Courtwright played for Ottawa & home games were played at the Varsity Oval on Nicholas Street. Gradually the team improved and won an intercollegiate championship in 1939. War interrupted play once again and there was no football until 1946 when Coach Wil Dixon led a team that played only two games, both against a Queens non-varsity team. By 1947, the Gee-Gees were back in the intercollegiate league (IIFIU) and were led to a championship by then coach Ted Edwards. The game of football was now rapidly spreading, and popularity increased to go along with the use of the forward pass. In 1953, move to Lansdowne Park, which they would now share with the Ottawa Rough Riders. Varsity Oval, as pictured in 1953. The original home to the Garnet and Grey. Matt Anthony, the new head coach of the Gee-Gees. During Anthony's 15 years at the helm, the Gee-Gees won seven league and conference championships, including three undefeated seasons. Anthony is still the winningest coach in Gee-Gees history. After Anthony's death in 2000, the University of Ottawa opened the Minto Sports Complex in 2001, with it came a multi-use turf field. Which came with a multi-use turf field that was named in the Matt Anthony Field in recognition of Coach Anthony’s legacy at uOttawa. The quality of team this year set the table for a run to the school's first Vanier Cup after posting a 7-1-1 regular season record. The Garnet and Grey advanced to their first appearance in the Vanier Cup (then College Bowl) national final, but lost 38-11 to the Manitoba Bisons at Toronto’s Varsity Stadium. Paul Paddon becomes the first Gee-Gee to win the Hec Crighton Trophy as the Most Outstanding player Canadian university football (1970). Players from the 1975 team were selected to the CIS All-Canadian team 13 times during their college careers. During their CIS careers players from the 1975 team were selected as OUAA All-Stars 42 times. 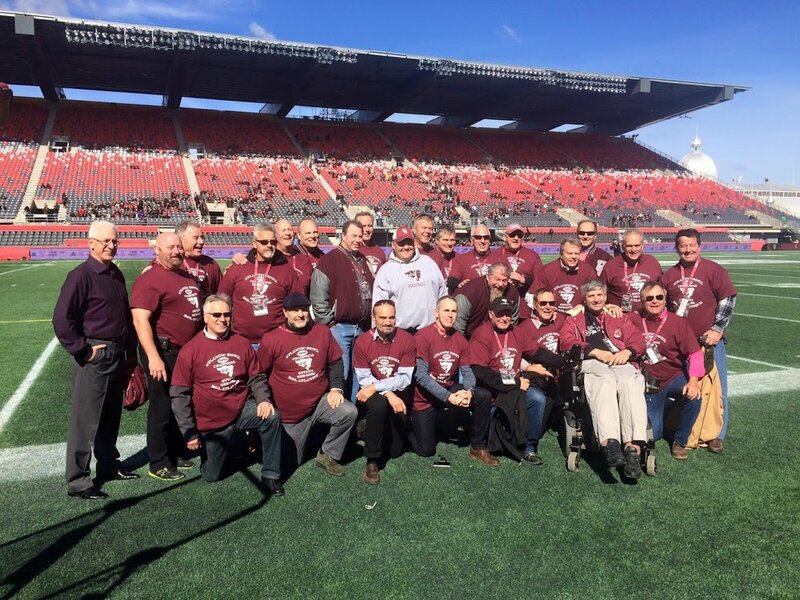 As of 2014, 12 Gee-Gees from the 1975 team have been inducted into the University of Ottawa Football Hall of Fame. * The 1st team ever to be inducted into the City of Ottawa Sports Hall of Fame . * The 1st team ever to be inducted into the uOttawa Football Hall of Fame. "I have just witnessed the greatest football team in Canadian College history! "Outlined piteously against the angry October rain swept sky the mighty Redmen "blew" an early 7-6 lead in the game and when at last the hooves of the uOttawa Gee-Gees ceased trampling over their jerseys, the Redmen dragged themselves off the field and into the archives as the victims of the worst defeat ever inflicted on a McGill team." By the time the 1975 Canadian Interuniversity Sport (CIS) football season was over the Gee-Gees had amassed a perfect 11-0 record. After a perfect regular season, they won the Yates Cup, then the Churchill Bowl and the right to play for the National Championship of Canada and the Vanier Cup. The crowning achievement came on November 21,1975. The game was played at CNE Stadium in Toronto. That night the Gee-Gees became the first undefeated team in Vanier Cup history. 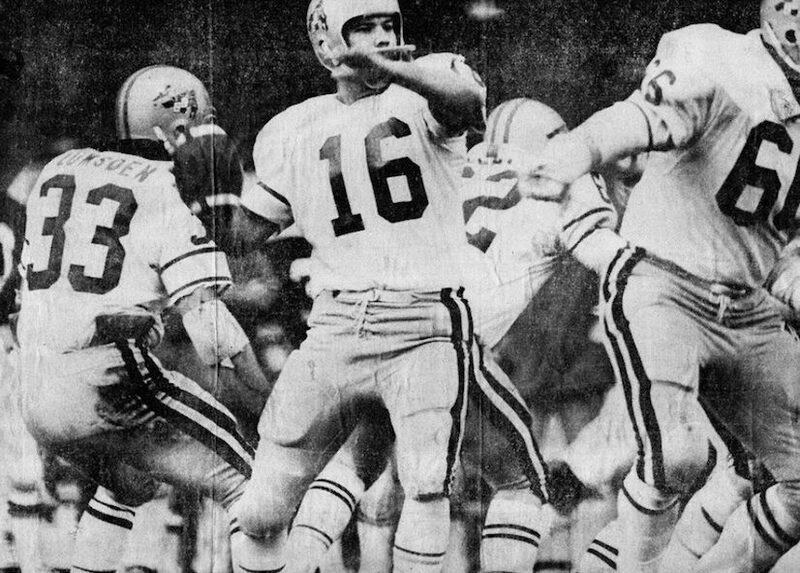 Perhaps the most astonishing individual achievement of all is that when All-Star quarterback Jim Colton was injured during the Vanier Cup game the Gee Gees were lead to victory by back up quarterback Yves Leclerc. Besides being a gifted athlete, Yves was also a gifted student. Yves was 16 years old at the time! Today, some 47 years later, the 75 team still holds several Canadian Interuniversity Sports (CIS) and OUAA team and individual records. Players from the 1975 team were selected to the CIS All-Canadian team 13 times during their college careers. During their CIS careers players from the 1975 team were selected as OUAA All-Stars 42 times. As of 2017, 15 Gee-Gees from the 1975 team (12 players, 3 coaches) have been inducted into the University of Ottawa Football Hall of Fame. In all, 22 players from the 1975 Vanier Cup Championship team would go on to be selected in the Canadian Football League (CFL) draft, a CIS record. This record, one that may never be broken, is even more remarkable considering that an additional 10 Americans from the 1975 team were not eligible for the CFL Draft. Those American players included Tim Leach, Pat Leach, Steve Carlo, Peter Hazzan, Ken Guarisco, Brian Keating, Jim Colton, David “DT” White, Sam Miller and Paul Britzky. All but 3 of these Gee Gees would be selected as CIS All-Canadians and OUAA All-Stars multiple times during their CIS careers. The 1975 Gee-Gees had All-Stars at every position. They had not only 1 great running back, they had 3 All-Canadian running backs including Neil Lumsden (All Canadian-1975), Billy Harrison (All-Canadian-1975) Mike Murphy (All Canadian-1976). All 3 were 1rst round picks in the CFL draft. No one in the history of the CIS has scored more career points than Lumsden (410). Since 1975 no one in CIS history has scored more points in a single season than did Neil Lumsden (148). Only 1 player has come close. That player was his running mate, Mike Murphy (144). It took 28 years for another team in the OUAA (2003 Mc Master) to score more touchdowns in an 8 game season than did the 1975 Gee Gees team scored in 7 games (43). Lumsden and Murphy both went on to be voted CFL Eastern Conference Rookie of the Year (1976-77). Lumsden was voted the Grey Cup’s Canadian MVP in 1981. Lumsden was inducted into the CFL Hall of Fame in 2014. In addition to their 3 All-Canadian running backs, the 1975 Gee-Gees passing game was led by OUAA All-Star QB Jim Colton, a native of Buffalo, NY. The 1975 Gee-Gees wide receivers included 2 time All-Canadian Jeff Avery and Rocky Di Pietro. They too would be CFL 1rst round picks. Rocky Di Pietro retired after 14 years in the CFL with the Hamilton Tiger Cats as the league’s all-time leading pass receiver. Rocky was awarded the CFL Outstanding Canadian in 1982 and again in 1989. He was inducted into the CFL Hall of Fame in 1997. Avery went on to play for 7 years in the CFL with the Ottawa Rough Riders and would become a 2 time CFL Eastern Division All-Star and a Grey Cup Champion in 1976. Jeff was inducted into the CFL Hall of Fame in 2017. With the exception of 2 kickers, no player in the history of the CFL has had a longer career than did Miles Gorrell. Miles played for 19 years. He was a 5 time CFL Eastern Division All-Star, 2 Time CFL Outstanding Lineman finalist. Miles was inducted into the CFL Hall of Fame in 2013. Few players in CFL history own more Grey Cup rings (5) than does former Edmonton Eskimo captain Eric Upton. Eric played in the CFL for 10 years. 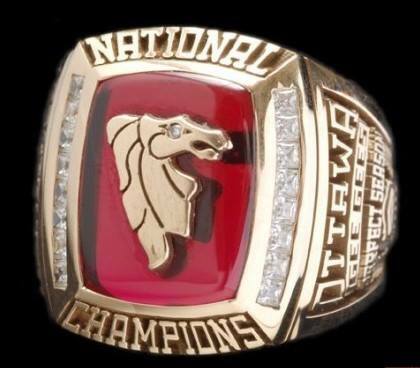 In addition too Upton there would be 5 other Grey Cup Champions from that 1975 Gee Gees team. Neil Lumsden went on to be a 3 time Grey Cup Champion. Miles Gorrell, Jeff Avery, Doug Falconer, and Rocky Di Pietro would all go on to be Grey Cup Champions. 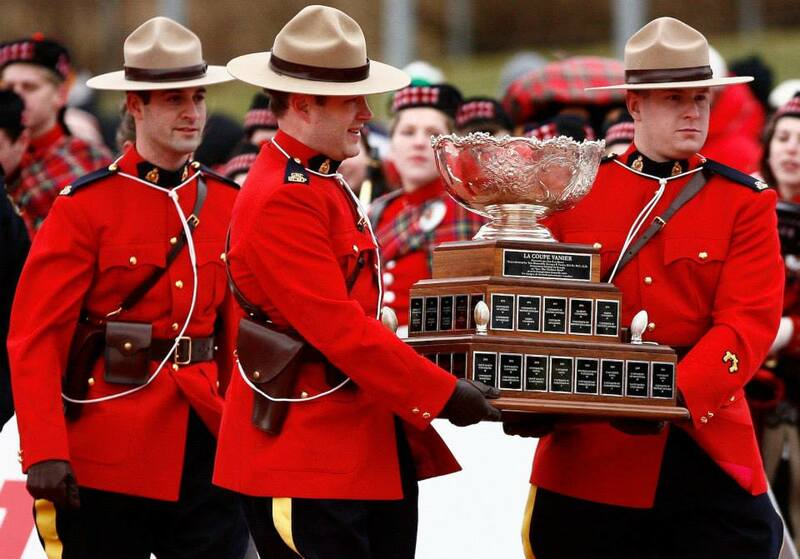 Together, all of their names have been inscribed on the Grey Cup. Eric Upton: Guard - 10 Years CFL Edmonton Eskimos, 3 time Western All-Star, 6 Grey Cup appearances, 5 time Grey Cup Champion. Rocky DiPietro: Slotback - 14 Years CFL Hamilton Tiger Cats, CFL All-Time Pass Reception Leader, Canadian Football Hall of Fame Inductee, 2 time CFL Outstanding Canadian, 3 time Lew Hayman Trophy Outstanding Canadian Eastern Division, 5 time Eastern All-Star, 4 Grey Cup appearances, 1986 Grey Cup Champion. Neil Lumsden: Fullback/Kicker - 10 Years CFL Toronto Argonauts/Hamilton Tiger-Cats/Edmonton Eskimos, Winner 1976 Frank M Gibson Trophy CFL Outstanding Rookie Eastern Division, 2 Time Eastern Division All-Star, 1981 Grey Cup Canadian MVP, 3 time Grey Cup Champion and Canadian Football Hall of Fame Inductee. Miles Gorrell: Offensive Tackle - 19 Years CFL Calgary Stampeders/Hamilton Tiger-Cats/Montreal Alouettes/Winnipeg Blue Bombers, 5 time Eastern Division All-Star, 2 time Winner Leo Dandurand Trophy CFL Outstanding Lineman Eastern Division, 5 Grey Cup appearances, 1 time Grey Cup Champion and Canadian Football Hall of Fame Inductee. Jeff Avery: Wide Receiver- 7 Years CFL Ottawa Rough Riders, 1 time Eastern Division All-Star, 2 Grey Cup appearances, 1976 Grey Cup Champion and Canadian Football Hall of Fame Inductee. Doug Falconer: Defensive Back - 4 Years CFL Ottawa Rough Riders/Calgary Stampeders, 1976 Grey Cup Champion. Al Moffat: Defensive Tackle - 6 Years CFL Hamilton Tiger Cats, 1 time Eastern Division All-Star, 1 Grey Cup appearance. Mike Murphy: Fullback - 5 Years CFL, Winner 1977 Frank M. Gibson Trophy CFL Outstanding Rookie Eastern Division. Tim Berryman: Linebacker - 7 Years CFL EdmontonEskimos/Ottawa Rough Riders, 1 Grey Cup appearance. Bill Harrison: Halfback - 5 Years CFL Hamilton Tiger-Cats/Toronto Argonauts . Ian MacPherson: Defensive Tackle - 3 Years CFL Hamilton Tiger-Cats. Terry West: Defensive Back- 1 Year CFL Toronto Argonauts. 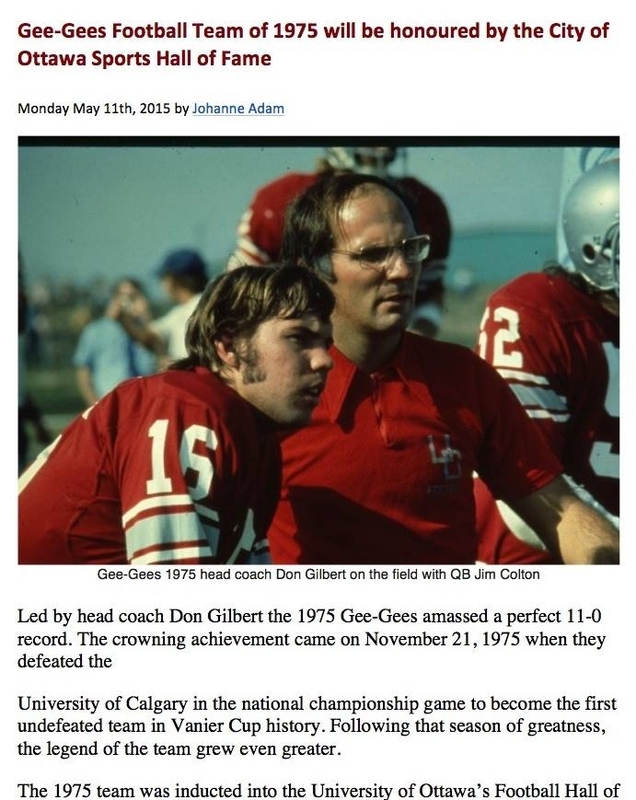 The 1975 Gee-Gees Head Coach was Don Gilbert, a former CFL great. Gilbert was awarded the Frank Tindell Award as the top collegiate coach in Canada in 1975. In 2000 Don was inducted into the University of Ottawa Football Hall of Fame. In 2003 Don was inducted into the City of Buffalo Sports Hall of Fame along with Buffalo Saber great Dominik Hasek and the Buffalo Bills great running back Thurman Thomas. The Coordinator of Intercollegiate Sports in 1975 is a CFL Hall of Fame inductee and long-time CFL coach and general manager Bob O Billovich. The undefeated 1975 National Championship team (11-0) is considered to be one of the most dominant in Canadian college history. That team became the first to finish with a perfect record after winning a Vanier Cup. Even to this day, the 1975 team still holds several CIS and OUA team and individual records. After the undefeated '75 season, Don Gilbert stepped down and assistant coach Dwight Fowler stepped up into the head coaching role. Fowler's team was not quite the same quality of the prior team, but still made light work of opponents. The team won the 1976 Yates Cup, led by quarterback Jamie Barresi the team moved on to the Atlantic Bowl where they met the Acadia Axemen. In a tight battle, the Gee-Gees lost 18-16 to the hometown team, Ottawa's Mike Murphy was named Most Valuable Player. Under Cam Innes, the 1980 Gee-Gees stepped out of the shadows and expectations of the '75 team and began the pursuit of a third Vanier Cup appearance in 10 years. The team defeated the Acadia Axemen in the Atlantic Bowl to reach the Vanier Cup final, but ran into a powerful Alberta Golden Bears team, to whom the Gee-Gees lost 40-21. In 1982, the team posed a 7-1 record, but were unable to reach the Dunsmore Cup. The team was led by senior quarterback Rick Zmich, who became the second Gee-Gee to win the Hec Crighton in his final year. The hire of local product Jim Daley helped the Gee-Gees return to grace after struggling under Clarke. Daley led his team to the Dunsmore Cup final in 1989. The team continued to be a national powerhouse during the early and mid-1990s. The teams led by former Concordia Stinger Larry Ring won three consecutive Dunsmore Cups in 1995, 1996, and 1997. In the 1997 season, the team went on to play in the Vanier Cup, they lost to the UBC Thunderbirds 39–23. Following the season, the Gee-Gees were stripped of their Dunsmore Cup and Churchill Bowl for the play of ineligible players. Following the team's sanctions, the Gee-Gees brought in Marcel Bellefeuille to become to new head coach. Building off of the powerful teams of the Ring era, Bellefeuille got to work building another contending team to hopefully break the school's Vanier Cup drought. 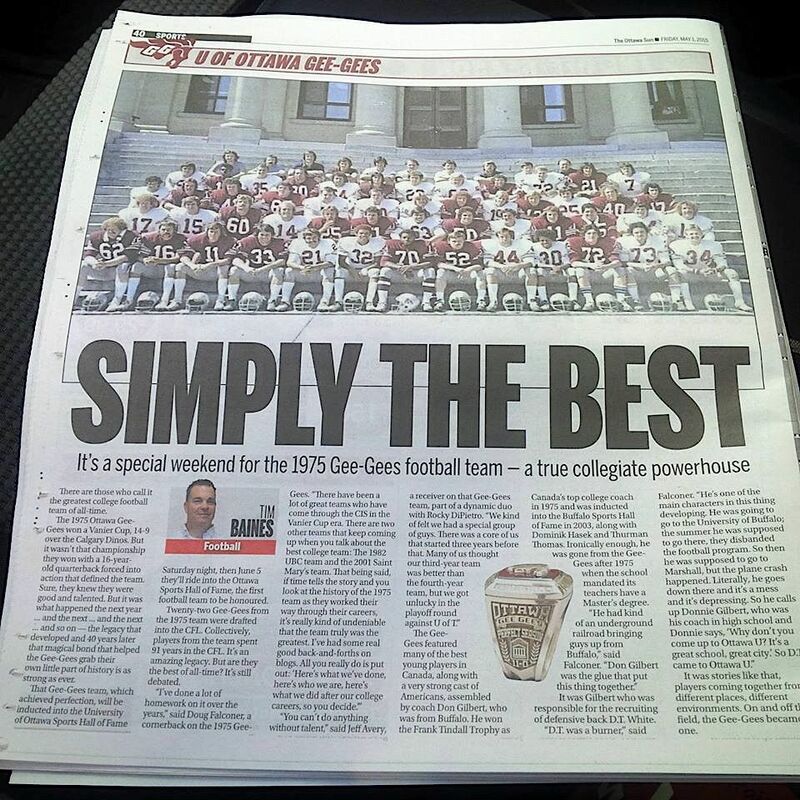 With a berth in the 36th Vanier Cup, the Gee-Gees once again had the chance to bring a second national title to the school, this time they would be successful. With one of the highest scoring finals, the Gee-Gees became champions again after downing the Regina Rams 42-39. In 2001, the team reached the Yates Cup after a move to the OUA, the Gee-Gees ran into a McMaster team ready to exact revenge from the prior year and defeated the team 30-22. The team reached the Yates Cup after a move to the OUA, the Gee-Gees ran into a McMaster team ready to exact revenge from the prior year and defeated the team 30-22. Head coach Denis Piché was hired to lead the Gee-Gees for the 2002 season and during his tenure, the team excelled, but failed to bring home another Vanier Cup. Piché started coaching the Gee-Gees in 1994, contributing to three Dunsmore Cups and two Vanier Cup appearances, including the 2000 team. He was hired as head coach in 2002, he led the team to a 44-20 record over his career, reaching the playoffs every year. During these years, the Gee-Gees had Yates Cup appearances in 2006 and 2007 including a 2006 Yates Cup win. Yates Cup final against rival Western Mustangs. The Gee-Gees lost the game 26-25 on a last-second field goal. Sinopoli was the fourth Gee-Gees quarterback to win the Hec Crighton that year, he then moved on to pursue a career in the CFL. After a 5-3 season in 2011 and an early exit in the playoffs, J.P. Asselin stepped down as head coach. The school hired Gary Etcheverry to be the team's head coach for the 2012 season. 2-6 record and out of the playoffs for the first time since 1991. 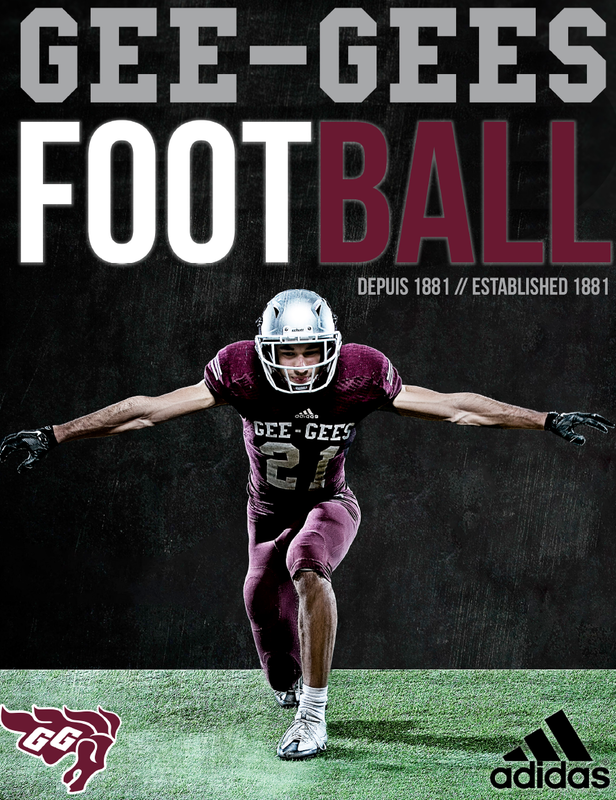 The Gee-Gees opened their 2014 campaign at home on September 1, 2014 against the York Lions with a 51-7 win. © uOttawa 1881 Gee-Gees Football Alumni Association | All rights reserved.